Animals change our lives. The unconditional love, the loyalty, the cuteness, the emotional reward of helping your pet overcome anxiety or learn how to shake a paw - priceless. Everything I do and care about has the central theme of mental health - and my dogs bring me so much stability and healing on that front. This is why I choose to photograph not only humans, but pets too. And when I do photograph humans, I come from a place of celebrating who they are, how they got there, and re-enforcing the strength and resilience that live inside them. Alison visits my studio with her Barney, the dancing dog! I love sharing my story with others, because more often than not, something about my journey of overcoming depression resonates with the listener. This is why I also ask people to share their story - because I know it will inspire many who are able to relate to elements of that journey. So today, I am very excited to give Alison Hogg from Wee Paws the opportunity to share her story with you. 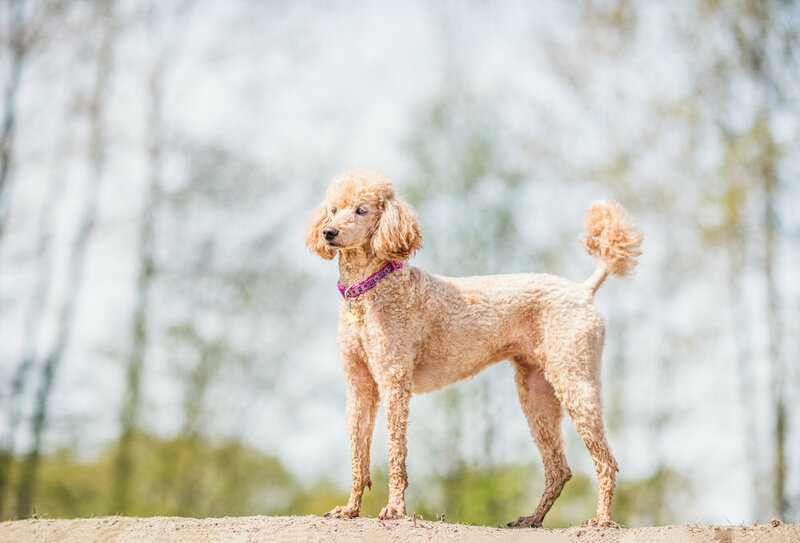 Wee Paws is a local Ladner dog walking and dog sitting business, focused on giving small breed dogs the space to play and thrive. But what I really want to tell you about is the person behind it - Alison. We met through the Facebook group I created called Ladner Dogs. I invited her into my studio, and I joined her on a Wee pack walk. I then asked her some questions to help us learn her story. Here it is! Let us know if it resonates with you and inspires you! 1. First things first, how did your own dog Barney come into your life? Barney... also known as B-rubs, Rubsy, Barnes and Noble. 2. What did your life look like 10 years ago, and what path took you to starting Wee Paws? Alison and Barney looking spiffy in the studio! Ten years ago I seemingly had a great life - I lived in a high rise in the West End overlooking the water, I worked for a professional sports team and from the outside, I had it made. In reality, I was miserable and living in darkness. What I didn’t know back then was not everyone was meant to work a ‘traditional’ job. I couldn’t figure out what the problem was, why was I so unhappy? I would live like that for another 10 years before figuring it out. Wee Paws came about after a few life changing events. First - my dad, my rock, my person passed away suddenly in 2014. Four days later, while on leave, I was let go from what I thought was my dream job. A month later, I moved back in with my mom in the community I grew up in. These three major adjustments flipped a switch in my brain that said, live your life now, while you have one. I went on antidepressants after suffering undiagnosed for years, I went back to school for Graphic Design, I won a scholarship to an amazing photography program, I started packing my life full of experiences rather than things. I soon discovered what I always knew… I’m not genetically designed to work for someone else’s dream, to plug away at a job for the sake of a paycheque. I quit my job and started my ‘actual’ dream job. Three months later Wee Paws was up and running! 3. Tell us a bit more about what Wee Paws is all about, and why small breeds? Wee Paws currently offers Pack Walks, Private Walks & Dog/House sitting. WEE are working on expanding some time in the future to have a daycare and boarding space. We are also looking to incorporate my design background with dog themed apparel. Our one year anniversary is coming up in July, and I’m hoping to have some new exciting things in place for our anniversary PAWty! I focused on Small Breed only because I noticed the need in the area. Barney was never comfortable in a large pack with large dogs. He just wasn’t thriving. 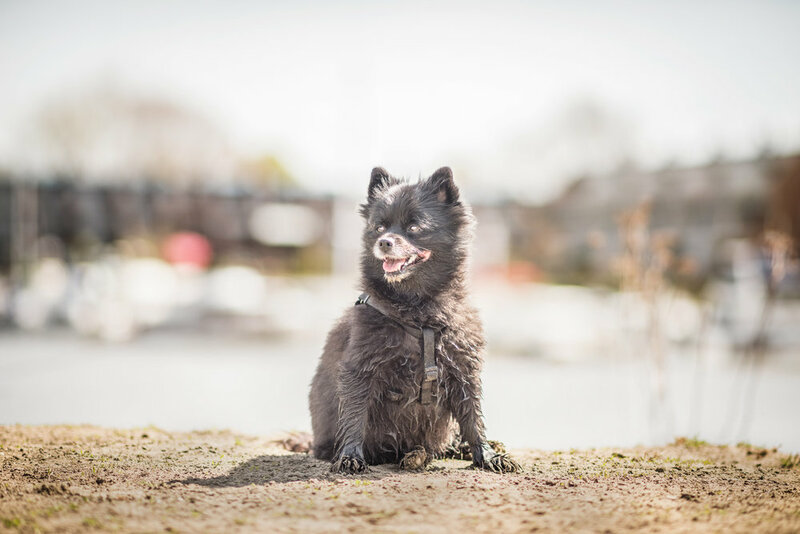 While living in Vancouver, Barney occasionally went to a small breed daycare and he was able to get his exercise and socialization in an environment he was comfortable with, and this is what I now offer my clients. I can’t tell you how awesome it is to see a dog go from anxiety ridden and scared, to having a personality, playing well with others and enjoying life. It literally brings tears to my eyes. All the dogs have such unique personalities. With this job, it’s not just wandering through the park and laughing at funny dogs, It’s always knowing what’s around the corner, It’s being able to understand dog behaviour well enough to anticipate issues before they happen. The coolest van ever - the iconic Wee Paws van! Findlay showing off. Or air-drying off?? Missy enjoying the sun at Harbour Park. Coco is the queen of the park. 4. What does a day in your life as Wee Paws owner look like? 5. What is your most memorable client experience? One of my favourite moments was when Sugar came out for a walk; I think it was her first time with the pack. She was having a ball and was running around at lightning speed. She came screaming down a path and didn’t realize it was a beach… With water! She was going so fast, she ran right into the water without realizing it until she was full on swimming. The look on her face was priceless! I think that was her first swim. She swam back, stopped, looked at me, and then went right on bombing around. When you're being a good boy for a minute - you get a little somethin'-somethin'! And that is Alison’s story! It bears many commonalities with my own - I too lived with depression for years before having it diagnosed, after which I put a lot of effort in finding support for myself - from medication, to therapy, to retreats, to a complete career change from mathematician to photographer. When I was going through it all, I felt like I was the only one. It is through meeting and talking to people like Alison, that I learned my story is not unique, and we need to share our stories more. Let us know in the comments below what resonates with you most. Having personally witnessed how Alison cares for her pack, and just how much fun and social time her dogs get, I highly recommend you contact her if you have a wee dog. Visit her website to get in touch: https://www.weepaws.ca/, check out her Facebook page for your daily dose of wee pups playing, and follow her on Instagram! If you'd like to work with me to share your story - please get in touch! info (at) radinaphotography (dot) com. Thank you for reading! Newer PostA story about a boy and his dog in pictures: meet Vlad and his autism support dog - Neville.